Looking for a kit that has it all? 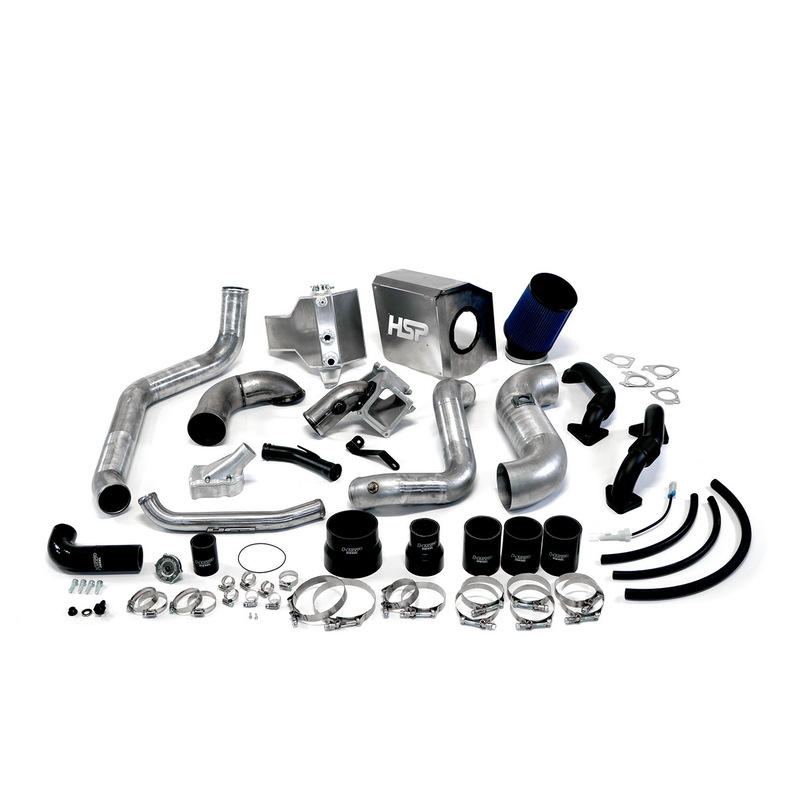 Featuring a mandrel bent 4 inch intake tube for massive air flow gains, with HSP's signature heat shield box eliminating unwanted hot air entering the cold air intake. For every 1 degree increase of intake air temperature will result in a 3hp loss. This kit also features HSP's high flow turbo mouthpiece. This turbo mouthpiece will give you the ability to reroute your factory PCV system and remove the factory resonator box, eliminating unwanted engine oil gumming up the turbo and intake system (PCV re-route sold separately see 003-1-HSP). Also included is our 3 inch mandrel bent hot side and cold side tubes with our easy to install two piece Y-bridge with race proven 5 layer silicone boots so you can be ensured a great fit that won't let you down. The factory hot side intercooler tube is only 2.25 inch in diameter, and has a 90 degree boot at the intercooler that is prone to failure. With this routing there is a possibility of the hot side intercooler tube rubbing on the power steering line, causing the line to rub a hole in the tube resulting in a boost leak. HSP's solution to this problem is to run the hot side tube directly into the intercooler resulting in lower temperatures, better air flow, and added clearance in tight places. Our bolted together two piece Y-bridge will make installation a breeze and ensure a leak free seal that won't leave you on the side of the road. To help get the exhaust gases out of the engine, this kit includes our factory replacement 2 inch up pipes. Our up pipes use .120 inch wall tubing with the toughest bellows on the market to ensure they last as long as your truck. When it comes to styling we have included our forward facing thermostat housing with coolant return to help keep your VGT turbo running cool. Is your factory coolant tank starting to show its age? Also included is our factory replacement coolant tank to keep your engine bay looking good. Our coolant tank features an all aluminum design with an incorporated low coolant sensor.